I went on a media tour of Mummies of the World this morning and it's far more intricate than the King Tut exhibit I remember going to see when I was a kid. Mummies of the World officially opens to the public at Discovery Place tomorrow, November 11 (11-11-11, how fitting for this tomb-esque exhibit) and runs through April 8, 2012. It's the Southern U.S. premiere for MOTW, which is the largest exhibition of real human and animal mummies ever assembled, with more than 150 specimens. Discovery Place is a science museum, of course, and that's what's really at the heart of this traveling exhibit (Charlotte is one of only seven cities that will show it). 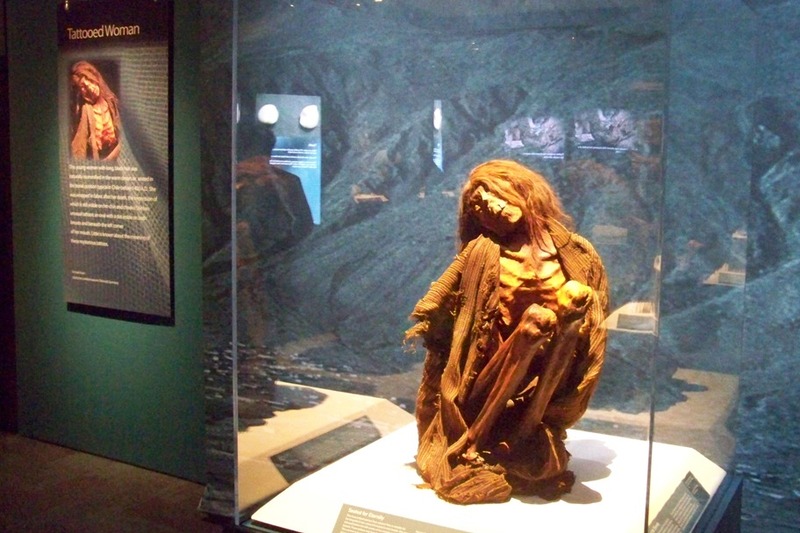 It's fascinating to see how these mummies have been preserved for centuries and how scientists study them to learn about cultures, the environment, historical eras, and even diseases. "The Tattooed Woman" is from Chile, believed to have lived before 1400. She's noted for her unusual tattoos--an oval with a dot inside on both breasts and her mouth. Walking through the exhibit, you'll experience a range of emotions. One of the first pieces you'll encounter is the "Monkey Mummy." This howler monkey is from Argentina and is believed to have been naturally preserved in the warm, dry environment of the area. But what makes it stand out is that it's displayed with a feather skirt and feather wreath around its head and neck--a fancy monkey it is, that'll have you going "awwww." But as you proceed through MOTW, you'll encounter other pieces such as a South American mummy of a woman and her two children that'll leave you a little sad. These are, after all, the remains of people who once lived. MOTW is a 12,000-square-foot exhibition so you'll journey through many sections, several of which are defined by the region where the mummies were discovered. I captured a short video, which you can see below, of a display in the European Mummies section. In the video is the Orlovits family, also known as the Vac Mummies, a husband, wife, and son group of mummies from the 18th century who were found in a long-forgotten church crypt in Vac, Hungary. Admission to Mummies of the World is $24 for adults; $18 for children ages 2-13 (you might want to think carefully about letting small children see it); and, $20 for students with ID and seniors ages 60 and older. All tickets include full-day admission to Discovery Place. For more details, visit www.discoveryplace.org or www.mummiesoftheworld.com. ‎Free Video Chat Rooms on Facebook 12 Monitor live for Room Free Video Conference Free Video Chat Free Chat Room If your browser is Chrome or have flash player already!.